New Zealand won't be posting a milk gain for its current production year, but the decline may be significantly less than many believe. Extremely wet weather on the North Island and a cautious approach from farmers after two years of belt-tightening contributed to a 3 percent decline in New Zealand milk output over the first half of the 2016/17 year starting June 1. 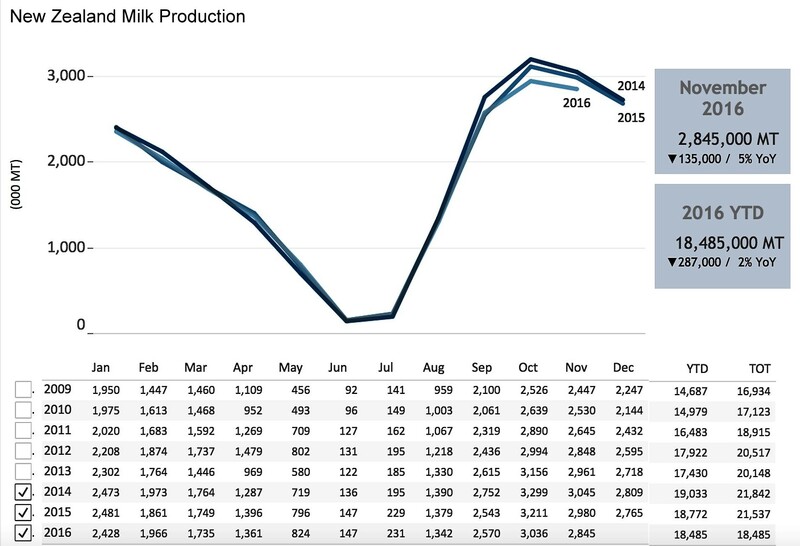 For October-November (the height of the Southern Hemisphere spring flush), milk collection fell 5 percent from the same period in 2015. Interactive charts: Go to our market information section, where you can drill down interactively for granular data based on specific dates, exporters and more. Charts like the one shown above can be created in the trade flows section. Analysts currently project up to a 7 percent decline in New Zealand milk for the full 2016/17 season. But given market conditions and New Zealand production history, USDEC estimates a decline closer to 3 percent. Wet weather in the New Zealand spring certainly eroded North Island output, and now some parts of the island are facing potential drought. However, pasture conditions are improved across most of the country compared to three months ago—North and South Island alike. And South Island output for the June-November period was already outperforming the weather-challenged north. After two-years of deficit operations with farmgate prices well below break-even levels, New Zealand raw milk prices are once again supportive of growth. Payout estimates moved into the black in the back half of 2016 and are likely to remain there for the remainder of the 2016/17 year. We are seeing a general softening in the pessimistic outlook. Fonterra Co-operative Group, the nation’s No. 1 dairy company, collecting more than 80 percent of New Zealand milk, recently adjusted its full-season milk production estimate from -6 percent to -4 percent. And New Zealand milk production forecasts historically lean to the conservative side, sometimes dubiously so. For instance, four months into the nation’s 2015/16 year (June-May), for example, Fonterra and industry analysts were cautioning about a decline of 6 percent that year, based on low farmgate milk prices and El Niño-related weather concerns. Those projections were arguably a driving force behind the short-lived commodity price upswing in the fall of 2015. When the dust settled at the end of the New Zealand production year on May 31, 2016, milk output had fallen only 1.6 percent. A similar episode occurred this season. 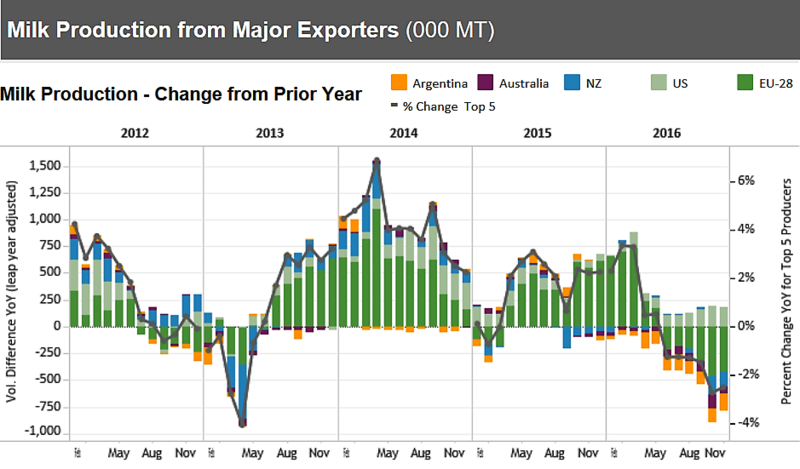 Commodity prices rallied last fall in concert with falling Kiwi production forecasts. New Zealand won't be posting milk gains for 2016/17, but the fall may not be as much as many believe. Editor's note: This analysis is based on data available on January 24.